The new Mega TRI64 Profile from American DJ is a full-size Par 64 fixture that offers all of today’s most-desired features, including advanced RGB color-mixing, energy-efficiency and a compact low-profile design. 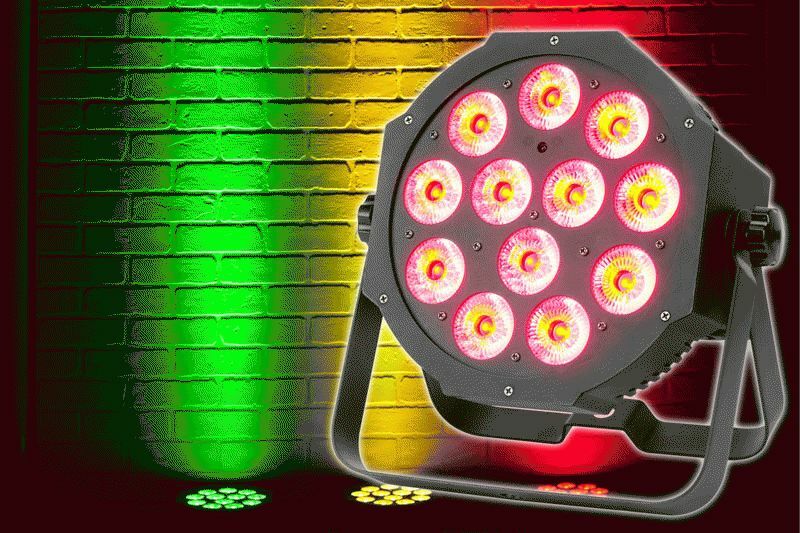 Equipped with 12 x 3-watt Tri-Color LEDs (red, green, blue), this powerful par will provide ultra-bright illumination for any theater or stage show without emitting heat onto performers, and it’s also ideal for uplighting, wall-washing and truss toning, thanks to a couple of American DJ exclusive features. The first of these “exclusives” is the Mega TRI64 Profile’s unique low-profile sit-flat design. Not only is this par extremely compact, it features a new, more intelligent layout with its power and DMX connectors positioned on the side, rather than the rear, allowing it to sit directly on the ground without a bracket. This common-sense design makes the Mega TRI64 Profile perfect for achieving easy and optimal uplighting, one of today’s hottest lighting trends. The ADJ-exclusive design also lets users place the fixture directly inside stage trussing without a bracket, for convenient, high-impact truss toning. Another of the Mega TRI64 Profile’s exclusive features is ADJ’s Tri-Color LED Technology, which combines three different-colored LEDs (RGB) into each lamp source. This 3-in-1 LED design provides smoother color mixing and eliminates the RGB shadows often produced by single-color LEDs. The Mega TRI64 Profile is the latest addition to ADJ’s extremely popular series of low-profile Tri-Color LED wash fixtures, said Alfred Gonzales, national sales manager for American DJ. “With the Mega TRI64 Profile, we are now offering a full-size Par 64 with our exclusive sit-flat design and Tri-Color RGB technology, which have proven right on-spot with today’s lighting trends. The versatile Mega TRI64 Profile offers 5 different operational modes, both DMX and manual, to accommodate a wide range of user needs, including: Auto Mode, Sound Active Mode, Stand-Alone Mode, Master-Slave Mode, and DMX-512 Mode. When in one of the manual modes, the Mega TRI64 Profile will run to its high-energy built-in programs. If used with a DMX controller, there are 7 DMX channel modes to choose from (1, 2, 3, 4, 5, 6or 7-channel) for a variety of programming options. A 4-button DMX LED display on the rear of the unit makes it easy to scroll through DMX settings. Users can also have the convenience of going wireless by using American DJ’s ADJ LED RC wireless remote (sold separately) to control the Mega TRI64 Profile from distances up to 30 ft./10M..
Other features on the Mega TRI64 Profile include: fast or slow color change operation; 32 built-in color macros; LED pulse and strobe effect; 0-100% electronic dimming; and flicker-free operation, which makes it great for studio and video streaming applications. The unit features a 25° beam angle, and it includes a removable scissor yoke for mounting, as well as IEC AC input/output on the rear to daisy chain power for linking up to 18 Mega TRI4 Profiles. Addressing the realities of today’s lighting market, the Mega TRI64 Profile is very energy-efficiency and maintenance-free. Despite its great brightness, it consumes only 38 watts of electricity at maximum use, and its long-life LEDs will run non-stop for 50,000 hours. Extremely compact, the Mega TRI64 Profile’s low-profile case measures 10.5”L x 10.25”W x 4.5”H/ 261 x 260 x 110 mm, and weighs 5 lbs/ 2.1 kg. The MSRP of the Mega TRI64 Profile is $349.95.